Aberdulais is a village in Neath Port Talbot, Wales, lying on the River Neath. The village grew around the Aberdulais Falls, the site of successive industries and now a hydro-electric station. The National Trust owns and administers the site. The name Aberdulais is from the Welsh for the mouth of the River Dulais. Aberdulais has a lengthy industrial history thanks to the abundant supply of energy derived from the waterfall and the presence in the vicinity of coal and timber. The first business here was a copper smelting industry, using ore delivered via boat from Cornwall. 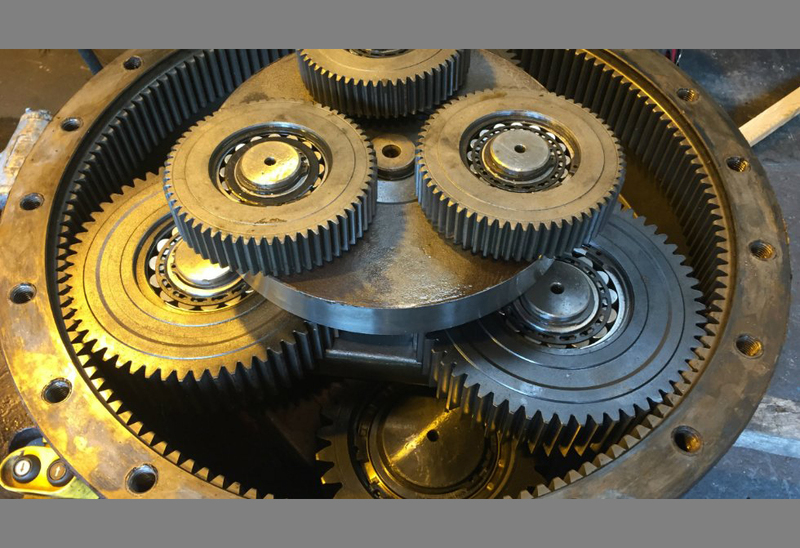 Over the years the site was successively used as an ironworks, a cornmill and a tinplate works. The Welsh tinplate industry was very successful for a time, until the American government levied heavy duties on imported tinplate. The present water wheel is a modern steel structure 8.2 m (27 feet) in diameter. 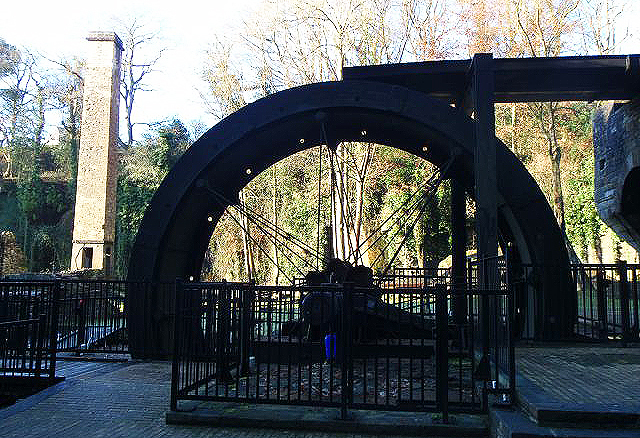 The water wheel at Aberdulais falls produces £20,000 worth of electricity that powers the site, and the surplus is sold back to the national grid. In the eighteenth and nineteenth centuries, various artists visited the falls to paint. In 1795, J. M. W. Turner used a sketch he made here of the waterfall and cornmill to paint his watercolour "Aberdulais Mill, Glamorganshire" which hangs at the National Library of Wales. John Ruskin also painted here. Local attractions include a canal and the Cefn Coed Colliery Museum. Aberdulais Falls and the associated industrial infrastructure are in the care of the National Trust in recognition of the site's value as a key part of the region's industrial heritage. Several of the old buildings remain, and the tall smokestack of the tinplate works towers above the site. The school house for the children of the workers survives. The remains of a bridge that formerly linked the site by a tramway to the Tennant Canal can be seen. 1584. Queen Elizabeth I needs hard cash to spend on warships to combat the threat from Philip of Spain’s Armada. Luckily, a German engineer, Ulrich Frosse, has a solution. He's perfected a new method of smelting copper to turn into coin of the realm. But it’s hush-hush stuff and he needs somewhere quiet and secluded to ply his trade. " ...far from the pryinge eyes of his competitors" - Ulrich Frosse. The place he chooses is... Aberdulais. What happened next? That was 200 years before the industrial revolution. And ever since, this narrow gorge at the mouth of the Dulais River outside Neath has been at the heart of the Welsh industrial story, thanks to its bountiful supplies of coal, timber and water.Copper-smelting gave way to ironworking, the milling of textiles and grain and – most significant of all – the manufacture of 19th century tinplate. It’s difficult to imagine today the heat, dust, noise and dirt that must have dominated the scene back then. Today, its picturesque surroundings are a haven for wildlife, native plants and visitors with curious minds, keen to explore. Back then, as one young Victorian tinplate worker observed: " It was so hot, the sweat ran out of their shoes" - Tinplate worker, aged 8. In its heyday, tinplate from Aberdulais was exported across the globe, until the Americans moved to protect their own infant industry and slapped huge tariffs on tinplate imports. Aberdulais’ days were numbered. Except it didn’t turn out quite like that. A century on – in 1980 – the National Trust acquired Aberdulais Tinworks and Waterfall and today the power of water generates ‘green’ electricity for the nation. History is repeating itself (although the Spanish are welcome visitors now rather than mortal enemies). Little remains of Aberdulais’ early history. But 30+ years of restoration and conservation by the Trust have brought the tinplate era back to life. The waterwheel turns in the original wheel pit; interpretation and films paint vivid pictures of what life was like. Local schoolchildren recount on film the stories of their forbears, who were put to work from the age of eight. And descendants of the tinplate workers recall the tales handed down to them by their great grandmothers and fathers. Mother Nature. And then there’s the waterfall. When it rains, it thunders. The awesome power of nature is all too apparent as gallons of water plunge over the rocks daily. On quieter days, it becomes more benign, offering food and refreshment to the resident colony of Daubenton bats, not to mention a host of birds like Dippers, Wagtails and Heron's. As the water of the Dulais river continues to flow, so too is the tradtion of using the waterfall as a source of power - driving Europe's largest generating waterwheel, and creating green energy. Aberdulais - An Industrial Revolution since 1584! The torrent of water running through the Dulais Valley has been the driving force for over 400 years of industrial innovation. The River Dulais rises below the slopes of Mynydd y Drum in the foothills of the Brecon Beacons.The waterway flows down the Dulais valley for approximately 13 kilometres (8 miles), south-west through the villages of Seven Sisters and Crynant before cascading over the Aberdulais waterfall. Here it joins the River Neath close to the tidal reaches near Tonna. The gorge in which the river and waterfall now lie was formed about 20,000 years ago. As a glacier further up the valley melted, the resulting melt water slowly cut its way down through the 300-million-year-old rock. This can be seen on the west side of the gorge today. The rock is Pennant sandstone, which is a very severely compressed bed of sand. Beneath it is a layer of coal, that has been gradually eroded by the flowing water allowing the rock above to collapse and form the Falls as we see them today. Originally the Falls were further south, but over the centuries, with continued erosion, they've been slowly cut back to their present location. The Dulais is a flash flood river, which means it rises and falls very quickly. In wet weather, and in winter, when the river is in full spate, it's a truly awesome - and noisy - spectacle. So why not don your waterproofs and wellies, and come down to find out for yourself. The Old School House Tea-Room. If buildings could talk... then this one could tell you a few tales. Many people have come and gone through it's doors over its 180 odd years, and for many different reasons. Nowadays, you'll be greeted with a warm Welsh welcome and a choice of tasty treats to dine on. During the thriving tinplate era, Aberdulais employed many men, women and children, with the youngest child being 8 years old. In the late 1830s the proprietors built the school room to enable the children to have some form of education after they had completed their 12 hour working day. The children were taught reading (mainly the Bible), arithmetic and various crafts. The tin workers often used the building as a reading room, using the Bible in their endeavours to improve their moral outlook. The building was often used as a meeting place for local Baptists and also for social events, including magic lantern slide shows and national elections. The tinplate industry moved to the lower works, and over time the building and its grounds became the property of Dr Prell. He used the school room as his surgery and was followed in succession by Dr Thomas. The building was occupied as a surgery until 1968. The building was then owned by the National Old Age Pensioners Association before being sold to the National Trust in 1982. In 1989 the building was refurbished by the ‘Friends of Aberdulais Falls’ and nowadays, along with the help of the volunteers, the building has been taken back to its roots, and become The Old School House Tea-Room, serving local produce to all the visitors of Aberdulais. In Victorian times, The Old School House fed the mind. Today it caters for body and soul, serving traditional local produce for the whole family. A friendly welcome awaits you at The Old School House Tea-Room serving a selection of traditional Welsh specialities along with a few home favourites. Regardless of the weather you can dine alfresco in the sun or soak up the atmosphere and cosy up in The Old School House with a cuppa. 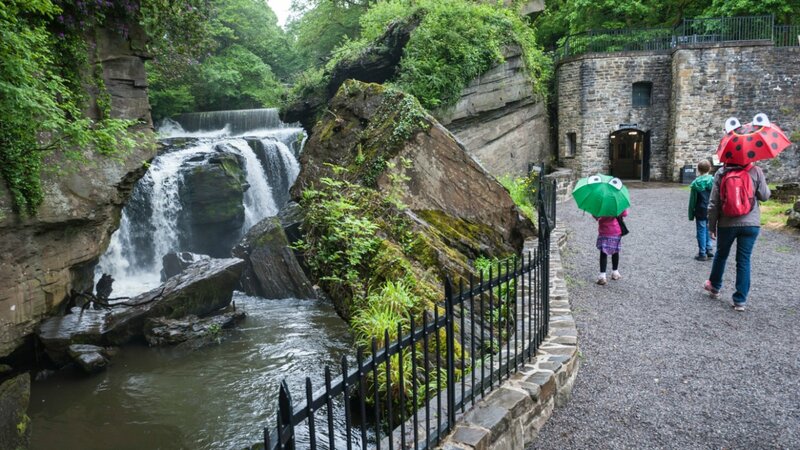 Then when you’re feeling refreshed, why not take a stroll around Aberdulais Tinworks, marvel at the waterfall and learn about the vibrant industrial history. Don't forget your four legged friend is welcome to join you whilst dining outside, you can even treat them to a dog biscuit when you treat yourself. Their shop offers a range of souvenirs, gifts and snacks. Pop in for delicious homemade cake or enjoy a light lunch and refreshments in the Old School House tea-room. The main car park surface is gravelled with embedded space markers. There is a pedestrian crossing available to use to cross the road. There is a second hand bookshop and seasonal plant stall. There are cycle racks are available alongside the tea-room. Baby-changing facilities are available in the disabled toilets. The site is fully accessible for pushchairs, with ramps and lifts. Family fun activities available throughout the year. There is Hopscotch and a maypole outisde the tea-room. Breast feeding is welcome in all areas of the site but should you prefer a more discreet area speak with a member of staff who would be happy to arrange one for you. There is lift access throughout the site. There are Disabled toilets by the tea-room and near the visitor center. There are suitable disabled spaces on the main road to accommodate up to three cars immediately outside the property. Two wheelchairs are available on site. Please ask at reception. Dogs welcome around the property and assistance dogs are welcome in the tea-room. Access for All passes available allowing free entry to carers.